Whether you’re a new parent or parent-to-be, there is nothing more exciting (and terrifying) than having a little one to look after in this world. We may have a whole new set of priorities, like being more sustainable in our homes, especially knowing what can and can’t be recycled. Items like baby furniture, play yards, diapers, toys, crayons, etc. start occupying – or taking over – our homes, and sometimes we’re not sure how to properly dispose of those items. Can disposable diapers go in the recycling container? What about the potty-training seat, the Diaper Genie refill dispenser or hard-plastic toys? Over the years, the packaging for items we purchase has evolved, and we may not always be sure how much of it can be recycled. Now, we are learning that the recycling industry has reached a crisis with the current model in this country, and it’s affecting markets nationwide, including Los Angeles. On average, around 40 percent of the items collected at the local recycling facility in Los Angeles are either too contaminated to process (greasy pizza box or sticky peanut butter jar) or are not recyclable and do not belong in the recycling container at all (furniture, diapers, clothing and food waste). This problem reached a crisis level earlier this year with the adoption of new quality standards by China, which had been the U.S.’s largest market for recycled paper and plastics. What does this mean for us? Even one dirty diaper can spoil an entire truckload of perfectly good recyclable materials and potentially send it to the landfill. These factors not only jeopardize the future of our local recycling programs— but our children’s futures. So, what can we do? In the long-term, many recycling companies are working to improve technology to better sort, process and clean the recyclable material as it comes into their facility. And, here is where we can help. It is more important than ever that families know what to recycle and how. Republic Services recently launched a recycling education campaign called Recycling Simplified that provides educational resources including easy-to-follow tips, videos and much more to help consumers become better recyclers. It’s an important issue for every town in America, and especially in Los Angeles with such high contamination rates. If we know what can and can’t be accepted in our local recycling program, we cut down on the risk of ruining clean recyclables. When it comes to recycling, everyone has a part to play. Working together, we can make sure recyclable materials make their way to where they are intended – to be made into new projects without using virgin resources. At home, “keep it loose” – there is no need to bag your clean recyclables. The sorting process at a recycling center happens quickly, and most of what is bagged or bundled ends up in the garbage because sorters cannot see the contents. Reuse the bags if possible or dispose of them in the trash. Often, you can return plastic grocery bags to the store where you got them for commercial recycling. DO: Recycle plastic bottles and jugs, including water bottles, beverage bottles, milk or juice jugs, detergent and cleaning bottles. DO NOT: Flexible plastics (grocery bags, plastic packaging, bubble wrap) and Styrofoam packaging require special handling and DO NOT belong in the recycle container. Although many toys, bottles and similar items are made of plastic, they generally can’t be recycled. Donate these items to your local charity or to a friend, or dispose of them in your trash if you must. Most furniture cannot be recycled in your curbside recycling container, but if in good condition, the items can be reused in another home or given to a charity organization. Familiar yourself and your family with the four major categories of recyclables and stick to it: paper, cardboard, plastic containers and beverage/food cans. Other common household items, such as shoes, toys, clothing, can be reused but NOT recycled. All those onesies and tiny socks that your baby has outgrown would be perfect for another child – but placing them in your recycling container won’t find them a new home. These items belong in a dedicated reuse collection bin. Clothing and shoes are a common contaminant in the recycling stream, no matter the size. Reuse bins can often be found in mall or school parking lots, or these items can be dropped off at your local charitable organizations. Extra Tip: Visit https://earth911.com/ to learn where usable items can be donated in your area. Clean or dirty – diapers are made of material that cannot be recycled. Please dispose of them in the trash. 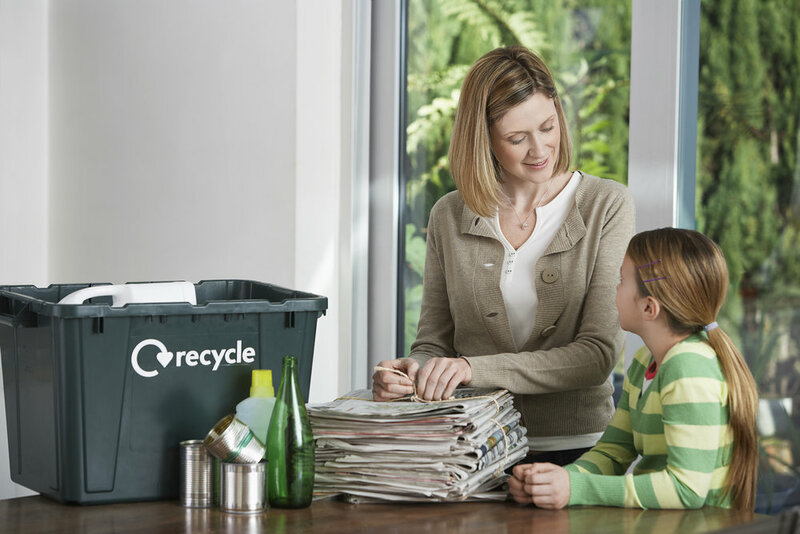 For more simple tips and guidelines to becoming a better recycler for your family’s future, please visit www.recyclingsimplified.com.